As a professional travel photographer, everyone asks my opinion on the best travel camera options this year. There are so many to choose from! Here’s what camera I would pick, and why. 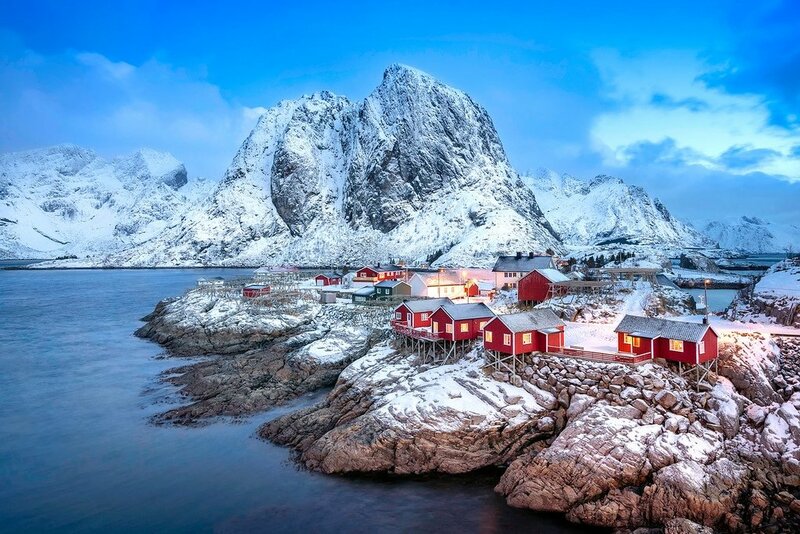 If you’re into photography, traveling the world with a good camera can help you bring back vacation images that will stand the test of time — memories to share with family and friends for years to come. Amazing travel photos are some of my most treasured souvenirs! But what’s the best travel camera for capturing these special moments on your journey? There’s no easy answer to this question. Different people will have different requirements and budgets. My goal with this digital camera buyers guide is to help you narrow down the overwhelming choices that are out there — and pick the perfect travel camera for your next trip. What Kind Of Travel Photography? 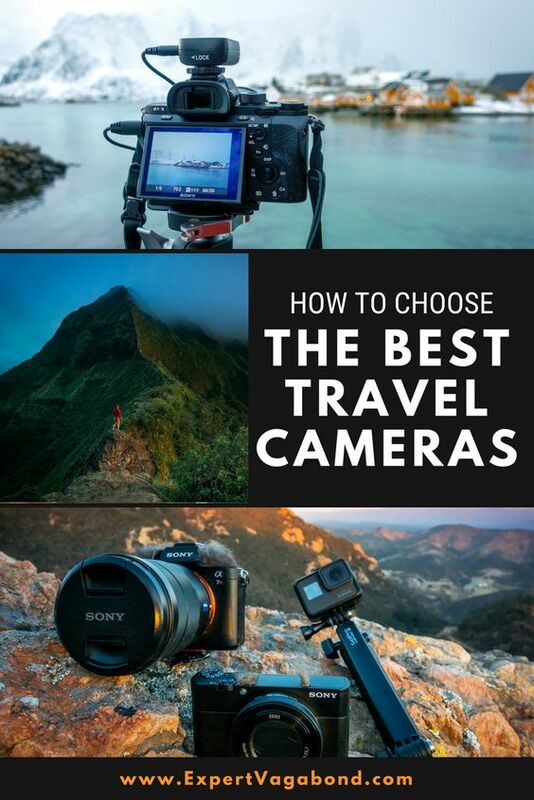 Which Travel Cameras Do I Use? Your Top Travel Camera Questions Answered! We’ll get to the juicy stuff in a second (I promise! ), but first, it’s important to understand what makes a camera good for travel. Experience! I’ve been traveling around the world almost non-stop for the past 9 years working as a professional travel photographer & blogger, selling images to brands & magazines. This guide is also independent, with no sponsored content. SIZE & WEIGHT – Gone are the days when a bigger camera means a better camera. If you want to travel with your camera, you’ll want something small & lightweight. MANUAL SETTINGS – Photography professionals want the ability to fully control the settings of their camera so they can dial in the perfect shot in all kinds of different situations. MEGAPIXELS – Many people assume that more megapixels is better. This isn’t always true if the pixels themselves are small. However more megapixels on a large sensor will give you higher detail, and allow you to “crop” your image without reducing quality. FAST LENS – Lens aperture is measured in f/numbers, like f/1.4, f/2.8, f/4, etc. The lower the number, the better it will perform in low-light situations. ZOOM RANGE – A zoom lens lets you get closer to the action, especially for wildlife or people. But the bigger the zoom the bulkier a camera gets. How much zoom you want is a personal preference. HD/4K VIDEO – Most quality travel cameras will shoot video in HD 1080p. Some even have 4K capabilities — which honestly most people won’t need unless you’re doing professional work. WIFI/BLUETOOTH – Some cameras have their own wifi network, allowing you to upload your photos instantly to your computer or smartphone. INTERCHANGEABLE LENSES – High-end mirrorless and DSLR cameras have interchangeable lenses, allowing you to pick the perfect lens for different situations. WEATHERPROOFING – Will your travel camera hold up against the elements? Some cameras are better protected from moisture and dust than others. 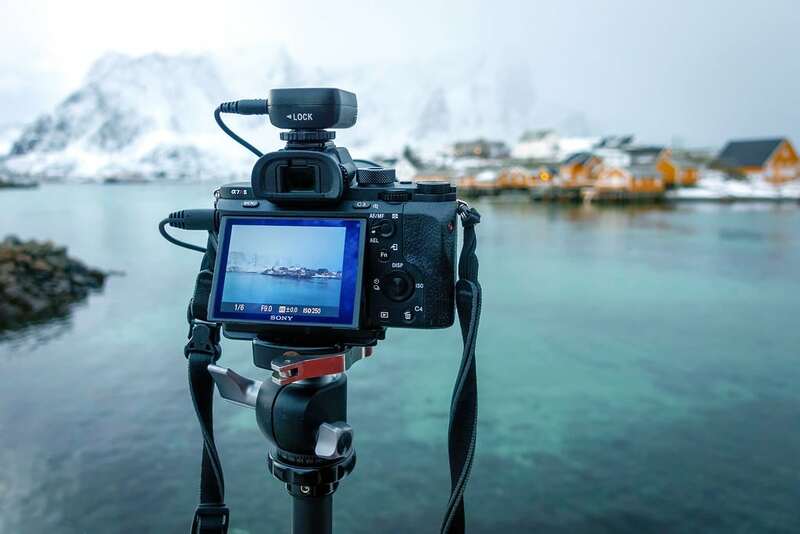 When choosing the perfect camera for traveling, you need to understand different camera sensors, and how they affect image quality and camera size. In general, a camera with a large sensor is going to perform better in low light because that large sensor can capture more of it. With a large sensor, you’ll also get more detail, allowing you to print your images large, or crop them smaller, and not lose any quality. 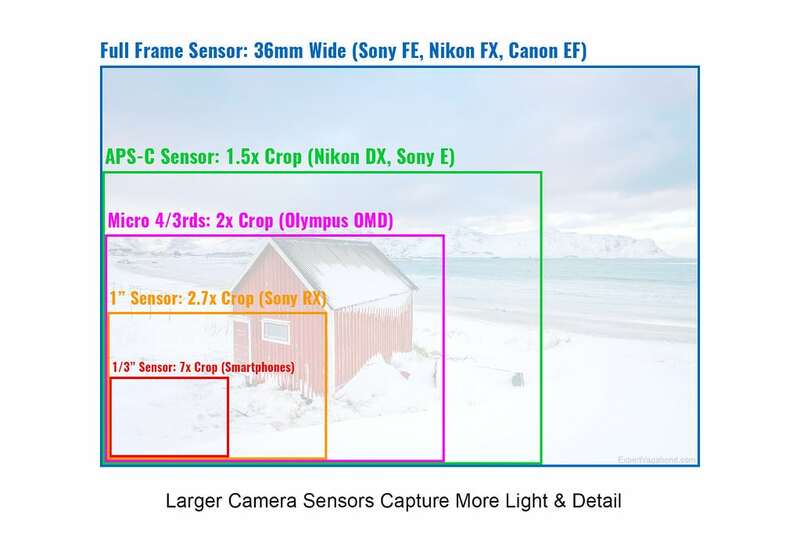 However, a large camera sensor means the camera itself will be larger as well. What’s the Top Camera for Traveling? When choosing the best travel camera for your needs, you must define what those needs are. Different cameras have strengths and weaknesses depending on what you’re using them for. Are you looking for portability? Weatherproofing & ruggedness? Professional high-end image quality? Something reasonably priced? Are you going to be shooting more landscapes, wildlife, adventure activities, or people? You often can’t have it all when it comes to travel cameras. Keep reading below to learn the pros & cons for each type of camera, and which types of travel photography they work best for. Point & shoot cameras have come a long way. As technology has improved, companies have managed to pack these pocket-sized cameras with tons of features. Some shoot 4k video and have manual settings, just like the more expensive ones in this list. The big difference is the camera sensor is a bit smaller, and they don’t have interchangeable lenses. In my opinion, a mid-range to high-end point & shoot is the best option for 75% of amateur travel photographers. They combine the perfect mix of being compact, powerful, and budget-friendly. The Sony RX100 V is my favorite small travel camera. It’s what I’d call a “professional” point & shoot. While it is compact enough to fit in my pocket, it has many of the same features as my larger primary mirrorless camera. It’s not the cheapest travel camera, but you can also pick up older models like the RX100 IV for a bit less. They also make reasonably priced underwater dive-housings for this line. It’s a great one for travel blogging! This is usually the travel camera I recommend for most people. If you want something nicer than a smartphone, but are intimidated by the size & weight of larger cameras, you’ll love the small Sony RX100. 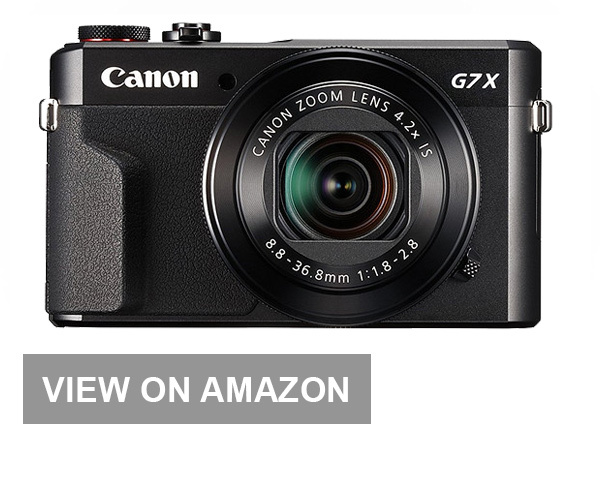 The Canon G7 X II is another fantastic compact point & shoot camera that’s great for travel photography. A bit less expensive than the Sony, it has fewer high-end features but shoots great video with better onboard audio than the Sony. It’s a favorite for many traveling YouTubers and Vloggers. You’ll save a bit more money with the Canon over the Sony RX100, but it doesn’t have as many high-end features (like 4K video). However the better microphone is a plus. Larger than a point & shoot, but smaller than a DSLR, mirrorless digital cameras are all the rage right now. Even professional photographers are starting to switch over due to their small size and ability to produce high-quality images. I use a mirrorless camera as my main travel camera. They offer more features than a point & shoot, like the ability to use interchangeable lenses, and a larger sensor with better low-light capability and detail. The Sony A7 III is the best travel camera money can buy at the moment. Sony has been on the cutting edge the past few years, and other brands are having trouble keeping up. Its sensor technology, focusing speeds, and dynamic range are incredible — while also being cheaper than competitors. Sony has specialty models too. 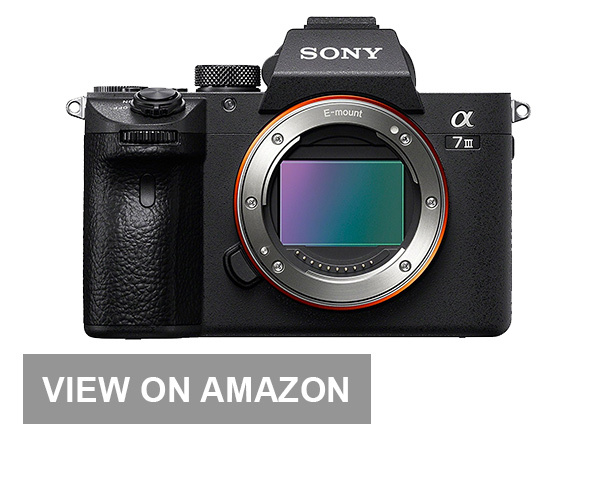 Sony A7S II is geared towards videographers, with extremely good low-light capabilities. The Sony A7R III (what I use) is for landscape photographers with a whopping 42.4 megapixels. The Sony A7 is a very high-end travel camera. It’s something I’d recommend for “professional amateurs”. Meaning, you already know how to shoot in manual mode, understand concepts like depth of field, and are a competent photographer looking to take your craft to the next level. 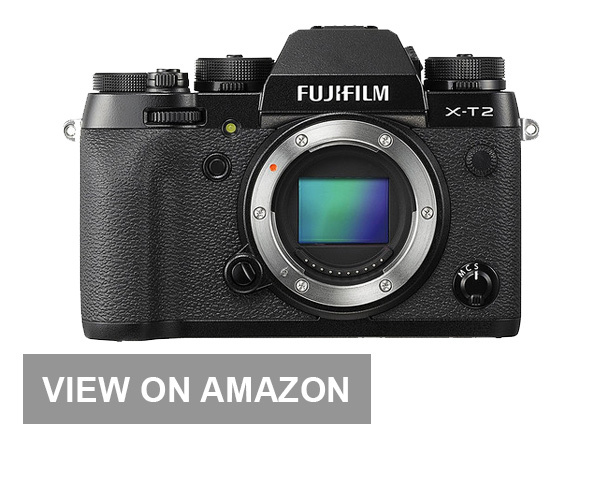 The Fuji X-T2 is a popular competitor to the Sony A7 mirrorless camera. I’ve used it while traveling before, and the Fuji is very well-made! My favorite part about it is the rugged all-metal dials that control this camera’s settings. One downside is the smaller APS-C crop sensor rather than being Full Frame like the Sony A7. Another is less power in low-light situations. The Fuji also has fewer focus points, half the battery capacity, and no internal stabilization. The Fuji is a favorite for travelers because of its small size, good lens options, and classic film camera design cues. 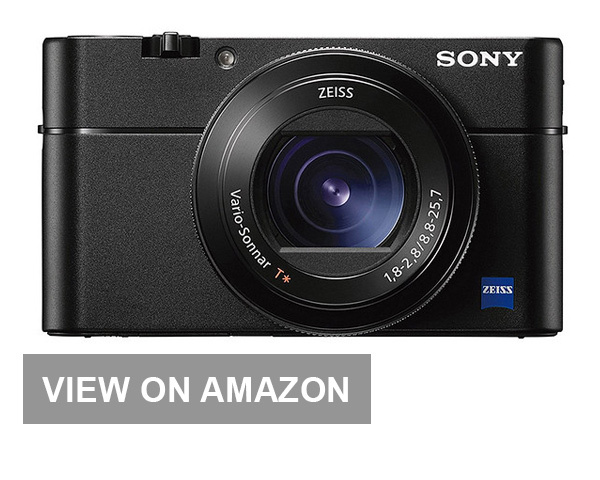 It’s a nice option for those who don’t want to spend the extra money on a top-of-the-line Sony A7. The Sony A6500 is an even smaller version of Sony’s awesome A7 mirrorless camera. The big difference is a slightly smaller APS-C cropped sensor, and less weatherproofing to protect against rain. The A6500 is also wonderful for travel video with 4K resolution and has a touch-screen, but a smaller battery and less low-light capability. 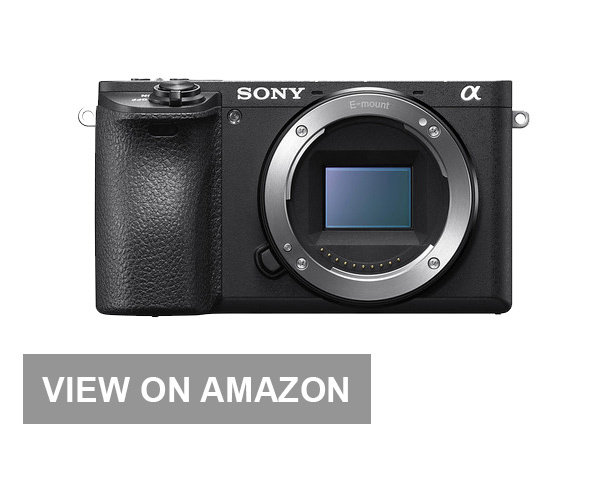 For a more budget-friendly version, the older Sony A6000 is almost just as good, for about $700 hundred dollars less! I really love the Sony A6500. It’s cheaper and smaller than the Fuji, but includes many features of the higher-end Sony A7 (like internal camera stabilization). This is the camera my wife uses. The EM-10 Mark III is Olympus’ latest excellent Micro 4/3rds model. Improving on the older Mark II by including 4K video, touchscreen control, and an enhanced sensor stabilization system, the Mark III provides a lot for a camera under $500 (body only). In-body image stabilization (IBIS) is incredibly handy for travel and street photography because it makes traveling with tripods less necessary. By stabilizing the sensor you can use slower shutter speeds to create extra exposure to make up for the smaller Micro 4/3rds sensor and keep your handheld shots razor sharp. Micro 4/3rds cameras are a good middle-ground option for a travel camera. The smallish sensors allow the body to remain compact yet still create photos that rival larger DSLR and full-frame mirrorless cameras. Action cameras have really transformed the travel photography & video world over the years. These tiny, waterproof, indestructible cameras can travel anywhere & record anything! 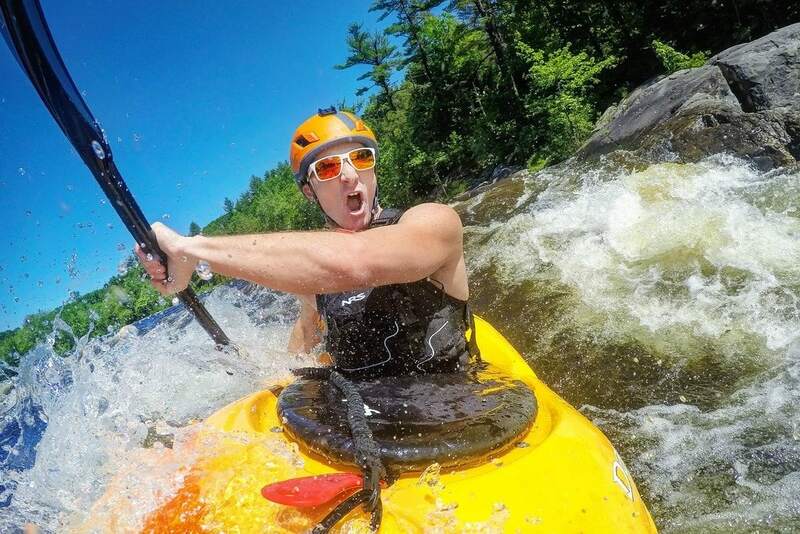 If you plan on hiking, mountain biking, surfing, kayaking, snorkeling, scuba diving, or even swimming under waterfalls during your trips, an action camera can create epic video & photos of the experience. The GoPro Hero 7 is GoPro’s best camera yet, with improved video stabilization, color, and 60p slow-motion 4k footage. It’s waterproof case and touch-screen will handle any adventures you dream up. A must-have for adventure addicts like me! One cool feature of the newer GoPros is voice activated control. This means if the camera is mounted on a helmet, or to a surfboard, you can just say “GoPro start recording” and other voice commands without actually touching it. Perfect compact travel camera for those of us who love adventure sports, especially if you need something small & waterproof, or are worried about breaking big cameras. The GoPro Session is GoPro’s smaller & cheaper model. Without a screen, this tiny cube can fit just about anywhere — you’ll barely notice it while traveling. 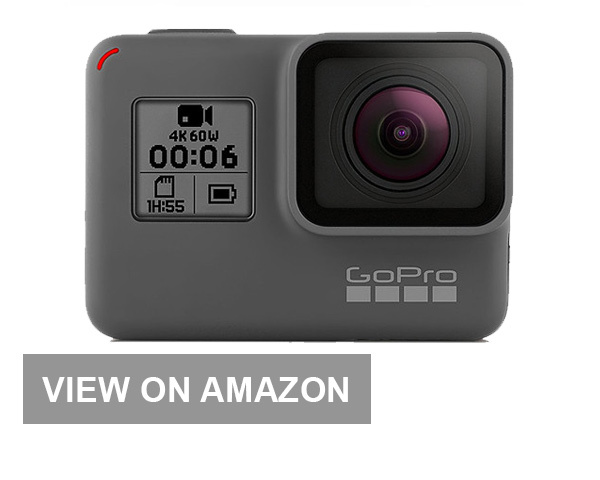 If you aren’t a complete action sports junkie, and just want a small waterproof camera for things like snorkeling or skiing, this will do for most people. One issue with the Session is that it doesn’t have a screen. However, you can connect it to the GoPro App on your smartphone in order to frame your shots if needed (plus a wide angle lens means you really just point it at the subject). 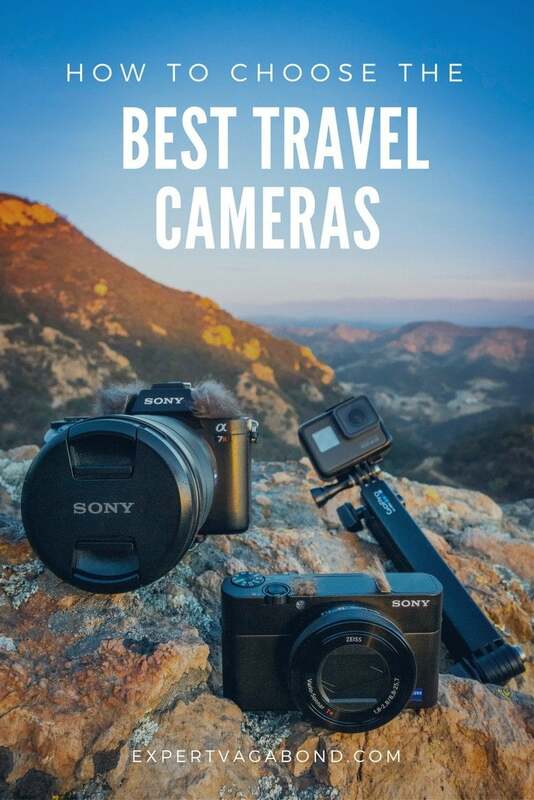 The smallest travel camera on this list. 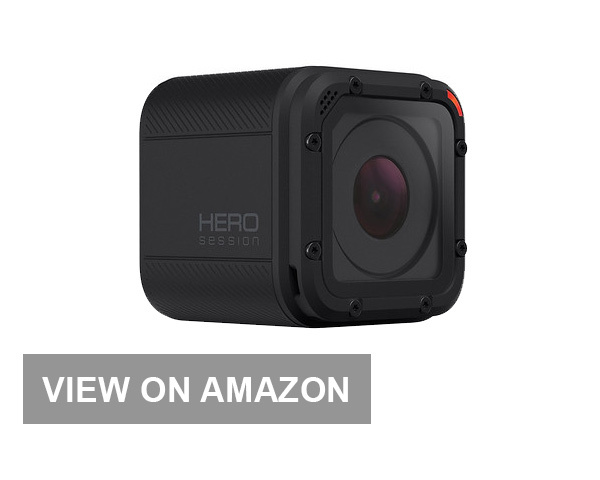 It has a slightly smaller sensor than the GoPro 7, you can’t change batteries and no touchscreen. But better for regular people who aren’t jumping out of airplanes all the time. 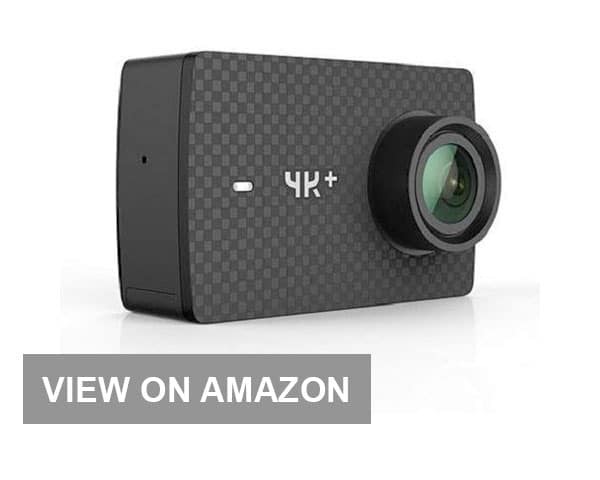 While GoPro generally controls the adventure travel camera market the Chinese made YI 4K Plus is a solid alternative that’s significantly cheaper as well. The features are nearly identical, including 4K video at 60 fps and touchscreen or voice control as needed. The YI also has digitally stabilized video, much like the GoPro, but offers little beyond basic 4K recording and a 12 MP photography experience. If you don’t need the additional features of the GoPro line the YI 4K+ is a decent budget alternative. This GoPro alternative is cheaper because it lacks more advanced features like HDR photography, tone mapping, and timewarp video. If you don’t need those, this will get the job done. Digital SLR Cameras (DSLR) wouldn’t be my first choice for a travel camera. Because these cameras use a physical mirror instead of an electronic viewfinder, the body is larger than on a mirrorless camera. Personally, I think most people would be better off with a mirrorless camera system these days. 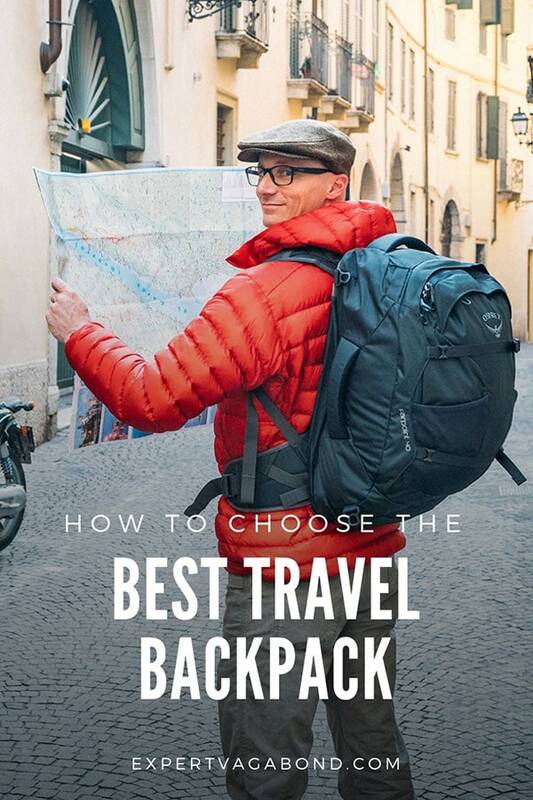 Especially if you’re trying to minimize the weight and size of your travel gear. However here are some options below. 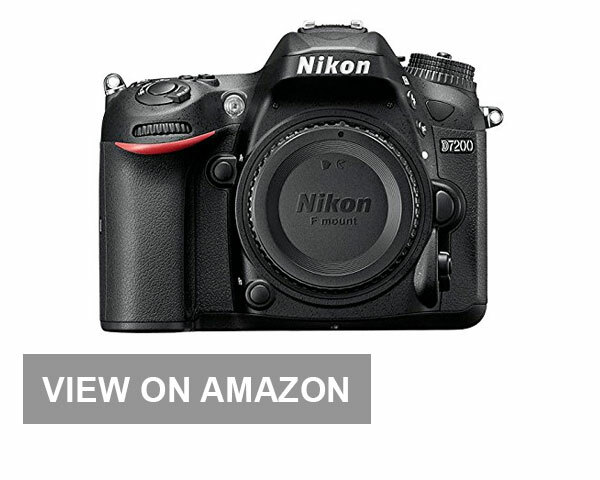 If you don’t mind a somewhat large camera experience the Nikon D7200 is one of the best entry-level APS-C cameras on the market. The 24.2 MP CMOS sensor is an oldie but goodie with hundreds of lenses to choose from. The standard optical viewfinder and SLR mirror design mean it’s not as discrete as the Fuji X or even the Sony A7 series. While great for all types of photography it’s not the sort of camera that fits easily into a back pocket or a crowded event without notice. 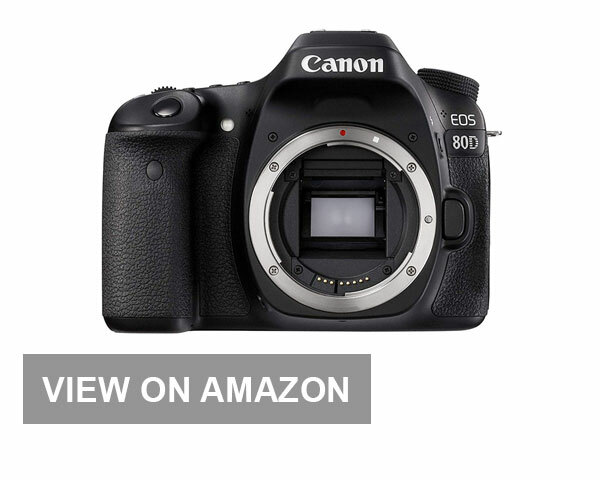 As a rugged upgrade for the many Canon Rebel users out there, the Canon 80D offers weatherization, a great feature to have on a travel camera. Dust and light moisture is prevented from ruining the electronics, as long as the lens is sealed. The moderate sized 24 MP APS-C sensor is a great compromise between size and exposure but the heavy DSLR body makes this less attractive for event and street photography compared to the likes of the smaller Olympus OM-D E-M10. Trying to save money on a travel camera? Here are some of the most popular budget travel cameras for under $500 with a lens included. They have fewer bells & whistles but are much more affordable. The somewhat venerable Nikon D3400 was one of the most popular DSLR cameras ever created, and for good reason. It has a slightly lighter body compared to the likes of the Canon 80D and a significantly lighter one compared to the Nikon D7200. The light body trades the weatherization that the other two DSLRs provide, but includes nearly every other features of the D7200 save wireless camera control. One standout feature of the D3400 is the insane battery life at 1200 shots per charge. Canon’s Rebel line is where many photographers begin their journey into the world of travel photography. Fortunately, the Canon T6 offers plenty to get you started. The large 24 MP APS-C sensor provides plenty of resolution for sharp images or cropping as needed and the controls are easy to use. With many lenses to choose from, you’ll find an aperture and focal length combination to suit any sort of photography style. While not a particularly discrete camera the T6 is affordable and provides great photo and Full HD video quality on a budget. 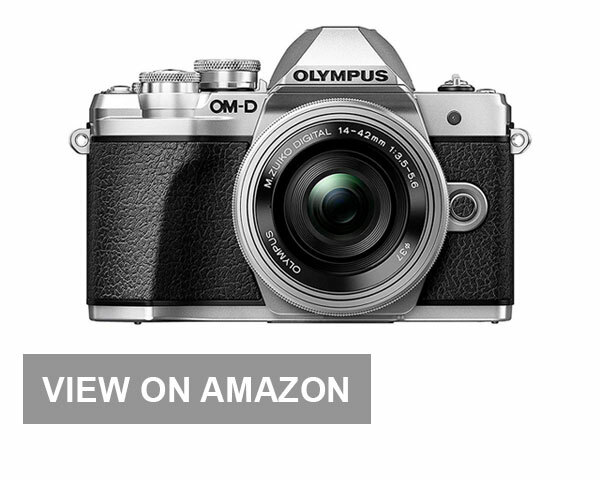 The Olympus EM10 II is just a slightly older model which has seen a price reduction after the Mark III was released. Now you can pick up this highly-capable compact micro 4/3rds camera with the kit lens for under $500. The big differences are that this model doesn’t include 4K video recording, and it doesn’t have a touch-screen display. But if you can live with that to save some money, this is a great option! 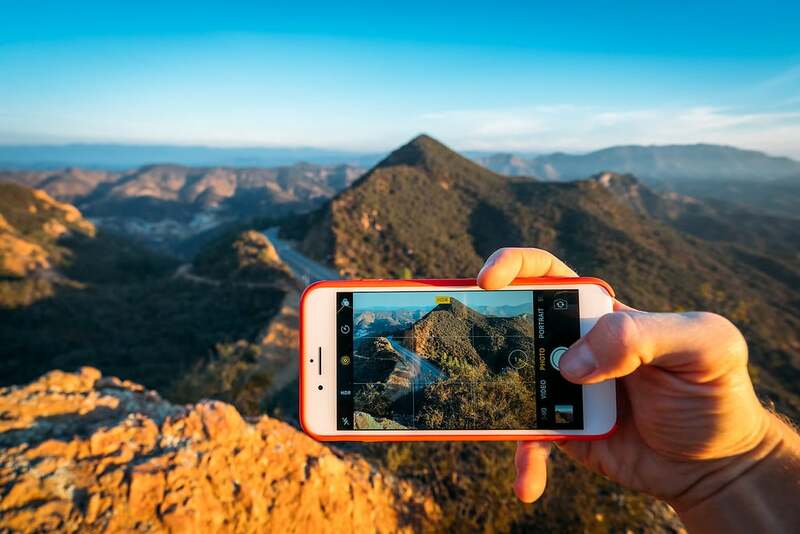 Can you use your smartphone as a travel camera? Of course, you can! You’ll sacrifice a bit of quality due to the super small camera sensor in phones, but if you’re only publishing images online, most people won’t notice. Smartphone cameras are continuing to eat into dedicated camera market share and the iPhone XS is one of the best on the market. With two dedicated lenses built in, a wide-angle f/1.8 on the rear and a telephoto f/2.4 on the front, you have a variety of viewing angles to choose from. The out-of-focus areas are surprisingly well rendered as well; while not as good as what you’ll get with a larger sensor and fast aperture, still amazing given how small smartphone sensors are. You can even adjust the background post-shoot using Depth Control to enhance background bokeh and make your subject stand out. The Honor 8X is another competitive smartphone camera that packs a surprising punch for a hybrid device. The AI (Auto) mode uses smart algorithms to select the best settings for a given scene but reduces the overall camera resolution to 12 MP. Pro Mode gives you as much control as you would using Manual on a dedicated camera, with ISO, shutter speed, color temperature, and more to control at your fingertips. In Aperture Mode, you can digitally recreate the look of apertures as narrow as 0.95 up to f/16, but the actual widest aperture is f/1.8. Google’s new Pixel 3 has one of the best portrait modes you can find and intelligently sharpens the borders around your subject while allowing for micro-adjustment of the background blur. The low light photography experience is also much better than either the iPhone XS or Honor 8. Night Sight allows for exposure stacking using multiple images taken in tandem and even non-stacked images properly preserve dark areas and bright highlights without excessive noise. With three total lenses available the Google Pixel 3 is the best smartphone camera on the market right now. You honestly don’t need a million different camera lenses for travel. When I first started traveling, I used a single general-purpose zoom lens that was perfect for most things. If you have money to burn, get two: a wide-angle zoom and a telephoto zoom. Two lenses will allow you to capture a mix of landscapes, portraits, and wildlife from a distance. However, lugging around multiple lenses and changing them can be annoying if you’re new to travel photography. To keep things easy, I’d recommend just one lens at first. Something with a decent focal range, like 18-55mm or 28-70mm. Because I’m a Sony guy, I’d pick up the 24-70mm F4 or the 24-70mm F2.8. When looking at the camera lens apertures, the lower the number, the better it is in low light. F2.8 or F4 should cover you for most situations. If you want to shoot star photography while traveling, go with F2.8. 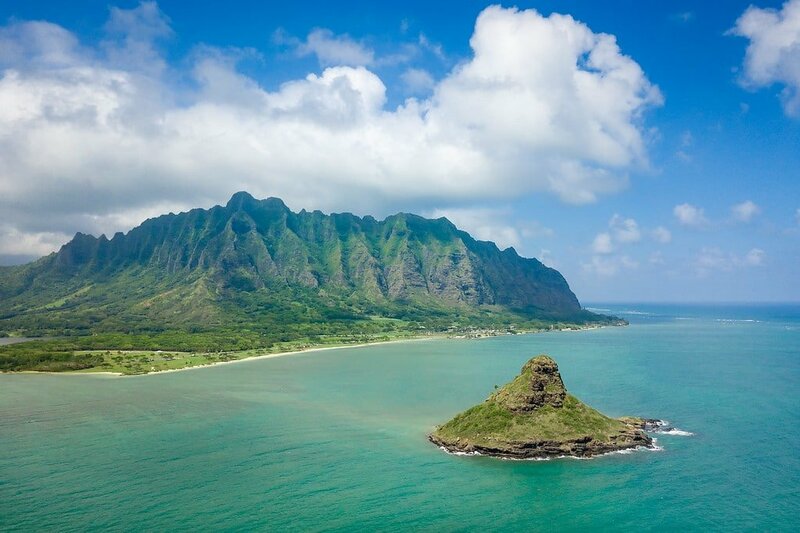 Drones are incredible tools for capturing images & video from a totally different perspective. But this probably isn’t the most important travel camera for the average person. Many places have restrictions on flying personal drones, for example, US National Parks, and even entire countries. So you need to do your research to avoid heavy fines or confiscation. If you REALLY want to travel with a drone, I’d recommend the DJI Spark for beginners. It’s tiny, pretty affordable, and very easy to use. If you eventually want to make money from your drone photography, and have a larger budget, than you’ll completely fall in love with the small DJI Mavic Air or more professional DJI Mavic 2 Pro. ➜ Check Out My DJI Mavic 2 Pro Review Here! I actually travel with 4 different cameras on my adventures around the world. This is a bit overkill for most people. However travel photography is how I make my living, so I invest in gear to help me accomplish my job. When I first started 9 years ago, all I used was a Canon 7D and a GoPro Hero. Sony A7R III – My main travel camera. Sony A6500 – This is my backup camera. GoPro Hero 7 – Action camera for extreme sports. DJI Mavic 2 Pro – Drone for aerial photography & video. The camera backpack I use is called a LowePro Whistler 350. It has room for a 15″ laptop, jacket, and incredibly fits all 4 travel cameras, lenses & some accessories if I need it to — perfect as an airplane carry-on. I want to let you in on a little travel photography secret. Even if you have a top-of-the-line $10,000 camera, your photos aren’t going to be spectacular if you don’t know how to use it. You don’t become a good photographer because you have a nice camera, your photography improves over time through practice, patience, and skills you learn from others. So sure, invest in a new travel camera if you think you need it, but remember to invest money & time into learning new photography skills if you really want to create those jealousy-inducing images for your Instagram feed! Here are some of my favorite beginner travel photography tips. Have any questions about travel cameras? What about other suggestions? Drop me a message in the comments below! I’m a pro photographer with several DSLRs and lenses, I never travel with them. They are simply too bulky and impractical, not to mention they will kill you on a outdoor shooting. The Sony RX100 is simply one of the best compact cameras that I’ve ever used. It’s got great depth of field and rich color. It’s not perfect for low light shooing but still not bad. One feature I like most is the ability to shoot in RAW so I can fix issues with the photo easily in post production. All in all, very good recommendations. I switched from Canon full-frame DSLRs to Sony full-frame mirrorless in 2014 and have never looked back. Much better video quality, smaller and lighter. When boarding a plane with two camera bodies and a couple of lenses, I no longer have to worry that my hand luggage is too big or too heavy. Any reason for why you do not recommend or list any cameras with a Micro Four Thirds sensor? I would guess that it would maybe be a good compromise for in between a 1” and APS-C so that it offers most of the quality benefits of an APS-C but provides some more zooming capability? Or is it simply just an awkward option that is not worth considering? I’d been meaning to include a 4/3rds option, and finally did above with the Olympus EM10. But I really think micro 4/3rds cameras are starting to get pushed out by APS-C sensor cameras that are just as small, but with that slightly larger sensor. Sorry…you forgot Olympus micro 4/3 cameras! Hello:) I would like to ask you a suggestion, I’m looking for a travel camera, for landscape pictures and wildlife captures. I have a t5 canon at the moment and I’m linking forward to make some photography lesson before I start. Hi Matthew, firstly great read on your travel Photograhy gear used. I am planning a few weeks travelling to Sweden, Norway etc in 2019 with my wife doing the tourist thing, but as I am an avid landscape photographer, I was wondering what you think about the following gear I plan to take. Sony a7riii with laowa 15mm f2 (Landscapes) & Sony A7rii with 24-105 f4 (travel shots) and do you recommend taking filters or add it in post processing. 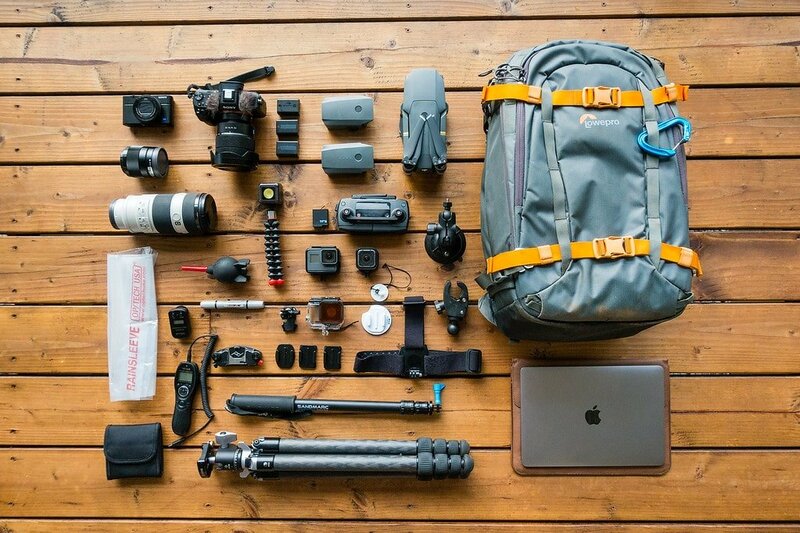 Do you have a special camera bag or do you just use a backpack? I use the Lowepro Whistler 350 camera backpack for most things, but I also have a small Lowepro Toploader for overnight backpacking trips in the mountains (which I attach to the front of a normal hiking backpack). 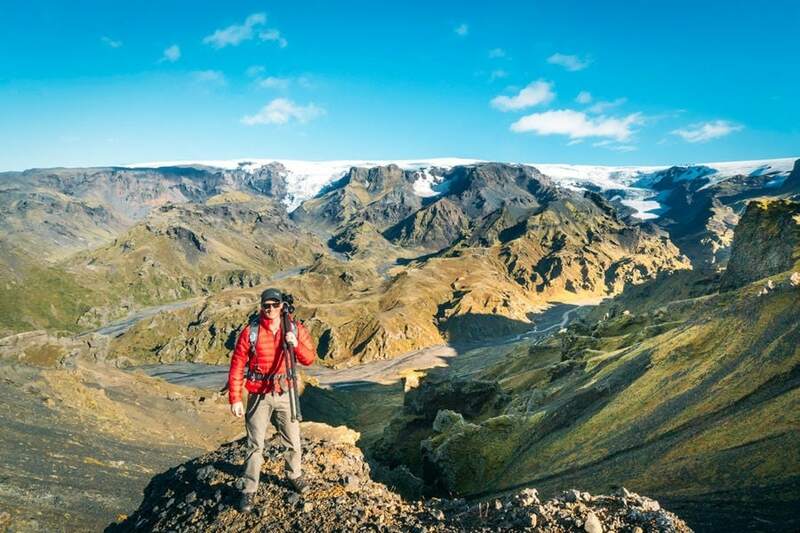 I’ll carry less gear on those kinds of trips — for example trekking 100 miles in Greenland or Afghanistan. I still love using my GoPro Hero 4 for food photos, especially when walking through local markets. That with a Samsung S7 and lots of tasty food photos. For me, my travel camera are my oneplus 3t and my Go Pro. These two are more than enough for me. nikkon d5400 i am using from last 3 years. Most people now a days use Gopro and it is also what I am using. And soon more people will use drone when travelig. 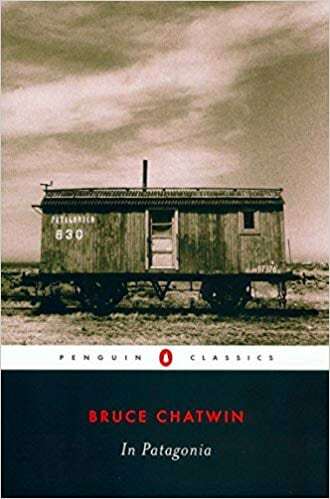 Very interesting read! I Love the Sony Alpha range and what it has done for my photography! Have always wanted to use GoPro. I myself I’m a Nikon DSLR kind of a guy. I stumbled upon your post and had to laugh.. we just finished posting one of our – best travel camera – post ourselves and we have the same conclusions in it. Although we wish we had invested a bit more in the A7rii but it will come .. maybe even the A9.., who knows? We’ll be coming back for more of your stuff.. your blog is invaluable – enjoy your travels and keep it up. The A9 is an amazing camera for sure! A bit too pricy for most people, but for professionals it’s really top-of-the-line right now. Thanks for sharing such a detailed & informative post, I was looking for a good post on cameras for traveling, and this answered most of my questions! Glad it helped Elizabeth! Which camera did you end up choosing to go with? Your blog was an eye opener for me . It helped me decide to go for DJI MavicPro which I was hesitant to purchase for along time after getting mixed reviews . Thanks for publishing such wonderful site . I had invested in lot of cameras and expensive lenses during the past 10 years from Canon EOS 60D , to GoPro and I was using them properly . Your web site was an eye opener for me .Thanks for sharing the details and tutorial on good photography . Great to hear Navin! Enjoy your new drone. They really do help you get travel photos and video from a completely different and cool perspective. I have always used the Sony A6000 since it was released, until I had to replace it for the 3rd time because of a shutter mainboard problem, it would just not turn on anymore and needs to be repaired by Sony. My guess is that I shoot too many Panoramas in a short amount of time, because I use different zoom angles for each Panorama. Wonder if I am the only person with that problem or anyone else had the same? Man, this was informative! I liked the sound of the mirror-less cameras. Sony seems to be the brand to go with at the moment. Sony’s are the best bang for your buck right now .. they have made some incredible leaps in that field. We just switched three months ago and are loving it. Oh man it’s a tough choice. I had a big DSLR for years and have just recently changed over to a mirrorless system. I found myself not going out with my DSLR on hikes because it was simply too heavy for me to use. Simply put, it became a burden. Especially on 30km+ days. Although the battery life is considerably worse on mirrorless systems, I’m certainly happier now. Anyway, the most important aspect of photography is being in the right place at the right time, not the tool you use to take the photo. Oh! what lovely pictures. This truly is one of the best cameras to carry while traveling. Great tips, thank you! I am always looking for more options to take better photos in different situations!!! Hi samantha, i really need to know more about the goodness of samsung camera so far cos many have recommend me to by Nikon. Without a good camera, a trip or a tour is useless.We went on to travel to enjoy and observe different places.The camera helps us to relive the memories later on.And this blog recommends the best camera according to me. Canon PowerShot SX430 IS Super Zoom Digital Camera Australia have you ever got lost on your travels? Ah Matt! I wish i had an molecule of creativity with a camera as you do! Thanks for a great article, i appreciate your recommendations because you’re so good with a camera! Do you get paid for travel photogrpahy? Yes. In addition to other kinds of travel marketing work, I’m hired to shoot photos and video for brands and destinations. In fact I just returned from a project in Canada with a watch company. I also sell images to magazines and online publications.